Flagship Klimax level version of the Akurate Exakt DSM, best matched with Klimax 350 speakers but can also be matched with other Linn Exakt speakers from the Akurate range. Earn 9200 loyalty points when you order this item. Linn Klimax Exakt DSM designed specifically for technology in Exakt Series’ Speakers is a network audio player incorporating inputs for additional sources. It performs as the heart of your arrangement letting you stream all your preferred music from cloud server or home network in supreme quality. Klimax Exakt DSM has the capability to handle any type of source from Studio Master downloads to streaming over Tidal and listening to internet radio. 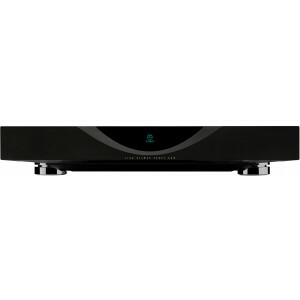 On top of this, there are various inputs neatly concealed on the back panel which enable you to connect any source in your living room whether its your TV, CD player or turntable. Each connected source profits from Linn’s finest audio circuitry and the remarkable noise isolation offered by the solid one-piece machined aluminium housing. Exakt Link delivers a lossless linking to the speakers. The technology showcases an advance in performance making the greatest direct connection ever between you and the artist. It spreads an intact digital signal path above all before removing sources of ambience and distortion. Exakt preserves the digital signal for longer and eradicates some lossy analogue phases. The sources of alteration and feedback that were formerly heard in the player, pre-amp, crossover and analogue cables are then all eradicated. Your chosen sources will also benefit from Space Optimisation technology which utilises a cultured acoustic modelling to gather a comprehensive picture of how your speakers, their location and the distinguishable characteristics of your room interrelate to disturb the sound you perceive. It then accurately recognises frequencies that are unintentionally distorted by your setting and decreases their presence to divulge the music that would else be buried. Irrespective of speakers or room plan you’ll get a performance that’s enhanced individually for you.